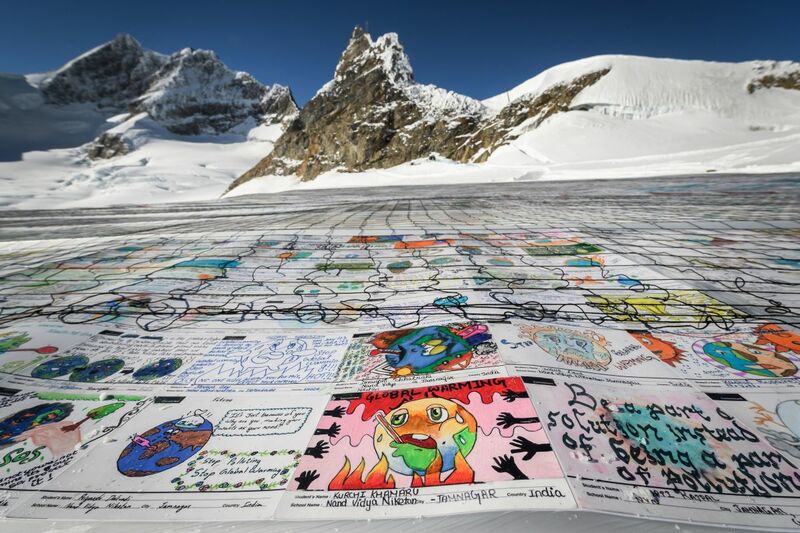 An aerial view shows a massive collage of 125,000 drawings and messages from children around the world, displayed on the Aletsch Glacier near the Jungfraujoch in the Swiss Alps, on November 16th, 2018. The mosaic of postcards, measuring 26,910 square feet, was laid out in the snow to boost a global youth climate movement ahead of COP24 in Poland. 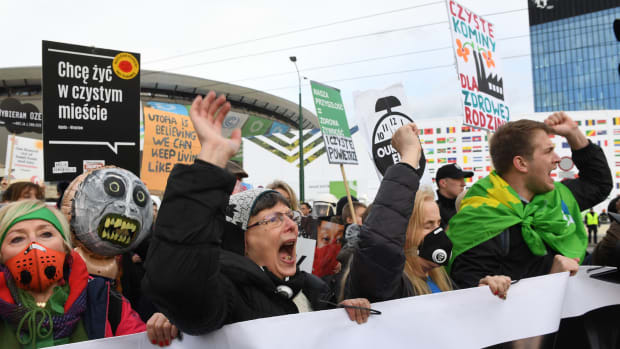 The stakes are high at COP24, the United Nations climate conference in Katowice, Poland, this year, where thousands of delegates are gathering to work out the details of the historic Paris Agreement. In 2015, the agreement&apos;s signatories gave themselves three years to write the guidelines that nations will follow to ensure that we limit warming to 2 degrees Celsius. That deadline is fast approaching, and progress on exactly has been excruciatingly slow, even as time is running out: Several reports on global emissions and the potential impacts of warming above 1.5 degrees, released in the lead-up to the conference, have made clear that a grim future awaits if emissions don&apos;t peak soon—and rapidly decline thereafter. 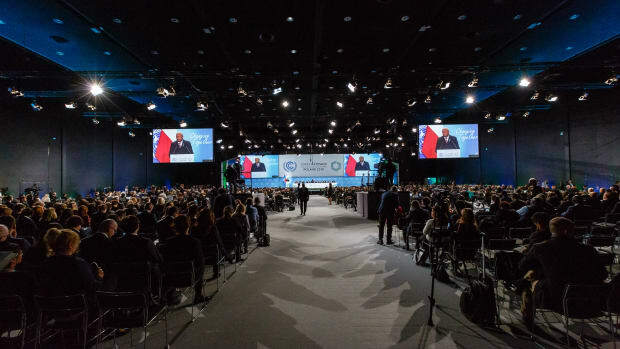 What would progress at COP24 look like? 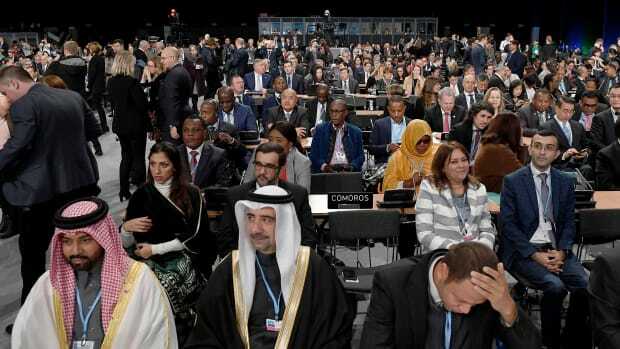 The U.N. climate talks—like any international, multilateral negotiation—are arcane affairs: Negotiators do much of their work behind closed doors, and speak in obscure acronyms and phrases. Here are several big things that climate observers will be watching for at this year&apos;s talks; some are more concrete than others. On a practical level, countries need to agree on the "rulebook" for the Paris Agreement. Arguably, the most important part of the Paris Agreement is its transparency rules, which will "keep countries honest, to each other and to their citizens, about the climate action they&apos;re delivering on the ground," Camilla Born, of the climate change think tank E3G, told reporters Wednesday. Right now, countries&apos; nationally determined contributions (NDCs) are drastically different from each other, not only in the ambition and timeline of their emissions targets, but even just in the formatting of the documents. All that variance makes accounting for global carbon emissions more difficult, if not impossible. It&apos;s hard to know, for example, what portion of global emissions is from the agriculture sector if not every country includes a breakdown of greenhouse gas emissions by sector. Transparency rules will provide clear guidelines for every country on how to measure and report emissions in the same way. "We&apos;re expecting to see a set of transparency rules that apply to everyone," Born said. That may not sound surprising, but it&apos;s actually a fairly significant departure from previous global climate treaties. Before 2015, climate treaties recognized differentiated responsibilities for developed and developing countries, based on the idea that less developed nations were less responsible for climate change in the first place, and less equipped to deal with it. The list of developed and developing countries was established in 1992, when 197 nations signed onto the U.N. Framework Convention on Climate Change. The first global climate treaty after that—1997&apos;s Kyoto Protocol—subjected developed countries to legally binding limits, and gave developing countries a pass. At the climate negotiations in Copenhagen in 2009, delegates attempted to create a treaty that would require commitments from all countries, but the talks failed. The Paris Agreement found a middle ground. It allowed each country to set its own targets, based on national circumstances and capabilities, but ensured that each country would be accountable to some shared measures of oversight and transparency. That second part is critical, because developed countries can&apos;t accomplish the goals of the Paris Agreement alone. In 1990, developing countries accounted for less than half of global emissions, but, today, they account for over 60 percent. China, for example, now emits more than the United States and the European Union combined. 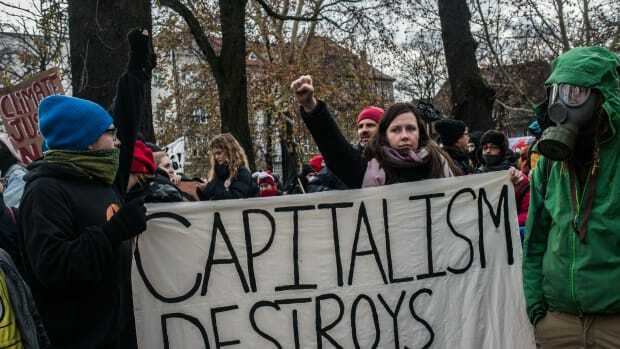 And while the lists of developed and developing countries has remained the same since 1992, the conditions and prosperity of those countries has changed—in some cases drastically. "A ranked list of countries with the highest gross domestic product per capita today will show a significant number of developing countries ranking higher than some developed countries," Todd Stern, a senior fellow at the Brookings Institution and the chief climate negotiator for the Department of State under President Barack Obama, wrote in a recent paper. Given that the economic conditions of countries are constantly changing, Stern says, "the idea of apportioning climate responsibilities on the basis of an immutable division of countries from 1992 makes no sense." High-emitting, emerging economies like China and Saudi Arabia, perhaps emboldened by the U.S.&apos;s disregard for the global accord, have spent the last year pushing to reinstate some elements of the old, bifurcated arrangement. 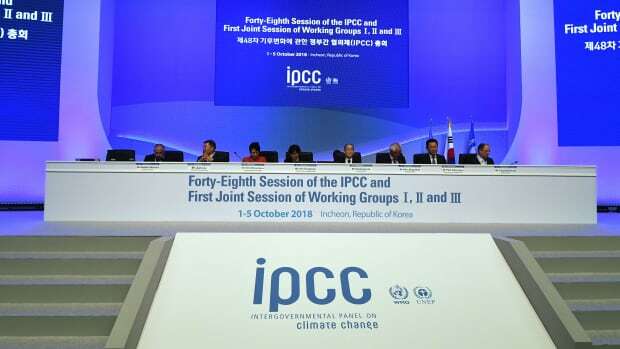 But ideally, the guidelines agreed upon this year will continue to "move us away from the bifurcated world we had in the past," Yamide Dagnet, a senior associate with the World Resources Institute&apos;s International Climate Action Initiative, told reporters last week. "What we want to see is everyone in the same boat." Countries also need to make some decisions about climate finance this year, according to Greenpeace&apos;s Jens Mattias Clausen. The world’s richest countries agreed in Paris to provide at least $100 billion in climate funding every year by 2020, to help the least developed countries increase their capacity to mitigate and adapt to climate change. "One of the key demands from developing countries is to get more predictability, to get an indication from the rich countries a few years in advance of how much they&apos;re going to deliver," Clausen said Wednesday. Donor and recipient countries also need to agree on what counts as climate finance, an umbrella term that could include everything from development aid to loans to export credits. If all of the above count as climate finance, "then it’s a lot easier to get to $100 billion," Clausen said. On Wednesday, Germany announced that it will contribute another $850 million to the Green Climate Fund over the next two years, effectively doubling its planned contributions. "These are exactly the kind of signals we need," Clausen said. On a more abstract note, to ensure that the deal remains effective, even in the face of waning support from influential countries like the U.S. and Brazil, messaging matters. Climate observers are hopeful that parties will to recommit to a key component of the Paris Agreement: a mechanism to increase the ambition of their nationally determined contributions. "We have all the evidence that we need for countries to move toward greater ambition," Fernanda Viana de Carvalho, of WWF International, told reporters on Wednesday. "So we&apos;re hoping that countries could at COP24 make declarations of how they will raise their ambitions by 2020." 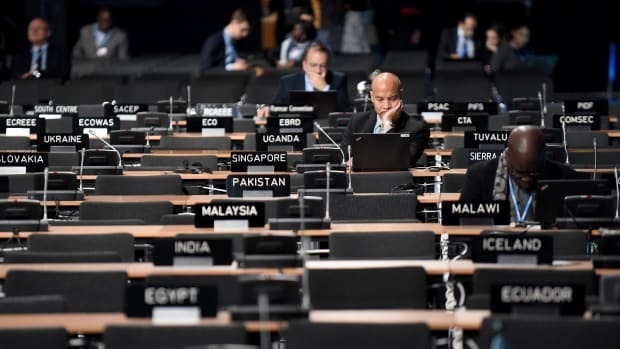 Several nations have already updated their NDCs with stronger climate commitments or announced their intention to do so, but right now watchdogs are more concerned with messaging than they are with the specifics. "What we can expect is not the actual targets," Clausen said, "but the commitment to enhance them." In the end, all these positive signals at international negotiations will need to be backed up by actual climate action back home. So if you&apos;re still wondering why all these high-level, multilateral negotiations matter for individuals, the simple answer is that solving the climate crisis will take a complete transformation of society. No single city, or state, or country can go it alone, but if parties participate in good faith, these international treaties can exert just enough pressure on reluctant nations to give humanity a shot at saving the planet.